Now that's adorable! 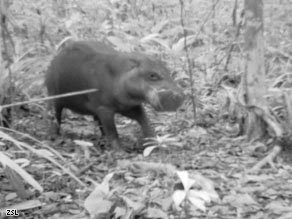 Pygmy hippos are rarely seen in the wild, but this one was recently caught on camera in West Africa. Read more here. Awwwwwwwwwwwww......when are the finalists being posted? I am on pins and needles! Can you actually say that? That is sooooo cute! I love it. Luffs it luffs it, luffs it. Today's the day for the finalists! Good luck to everyone! Ooh! I can't wait! Oh, and does anybody know how to make a simple robot? That can walk and stuff? I don't know why, but I really want to make one. Who are the finalists? I must know!! when are the finalists being posted? IM: It's one of the mysteries of the universe, I suppose. EVERYONE: 8PM New York time!!!!!!!!!!!!!! GOOD LUCK! YES!!! 8 PM NY time! I can't wait! NY is 2 hours ahead of Cali time, right? Anyway, I am soooooooooooo excited! I CAN'T WAIT!!!!!! Good luck to everyone! OMG!!! So if its at 8 NY time, it's 7 my time! omg! i can't wait! Why is it so late??? Are the judges still judging, or do you just want to torture us??? I MUST KNO!!! Thx Kirsten! Ooh! I can't wait! LESS THEN 2 HOURS!! is it time 4 da pictures yet????????????????????????? HURRY!!!!!!!! be4 i eat myself!!! New England time is awesome, no need for Miss. So-terrible-at-math-that-her-teacher-took-a-week-sick over here to do any of that awful calculating stuff. "WHAT?!? 3 pages of math homework??? NO!" the suspence is killing me!!!!! the only way i'm surviving is reading kiki strike and the shadow city for the millionth time!!!!!!!! only 42 minutes to go! Ohmigosh,I cannot wait, I'm talking really fast!!!! !I CAN'T WAIT! It's 5:00 (8:00 your time) and the pics aren't there! I might die of needing to see them! Oh, well I guess 8:00 could be a aproximate... forget this whole comment. I guess I better stop commenting about how I'm dyeing (How the heck do you spell dying?) of suspense so you can acually post, huh? Mysterie- You spelled "dying" correctly the second time.